Welcome to my day of Pat Sloan's Girls in the Garden Blog Hop! I'm so excited to be taking part in such a fun project! 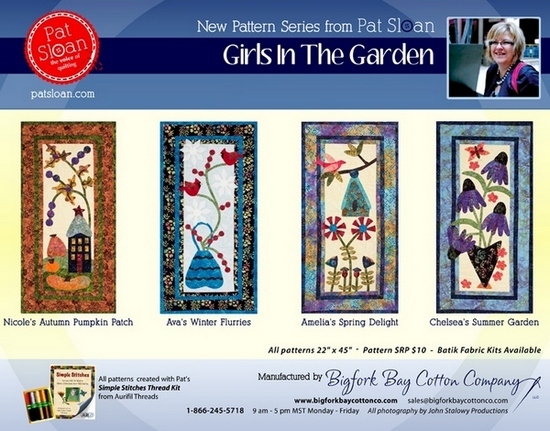 My dear friend Pat asked five designers to put their own spin on one of her new Girls in the Garden patterns for Bigfork Bay Cotton Company. 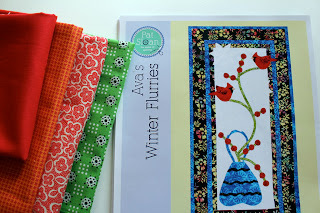 I loved all of them, but I was immediately drawn to Ava's Winter Flurries, since it's winter here in Ohio and cardinals are some of my favorite birds. Here is Pat's original pattern. Isn't it cute?? I chose some fabrics from my stash, including some of my prized Katie Jump Rope by Denyse Schmidt and a few solid cottons. The pattern is well written with clear, easy to follow instructions. Pat walks you through everything from applique to assembling and finishing the quilt. And (this is so smart!) all of the applique patterns are reversed, so all you have to do is trace the design on your choice of fusible web. I found it helpful to tape the pattern to a window and then place my Heat N' Bond Lite over it, tracing the designs with a fine-tip Sharpie marker. Then just cut out the traced pattern pieces and adhere them to your fabrics of choice. Cut all of the them out, then lay out the design and fuse the pattern pieces to your foundation fabric. Pat's pattern is for a wall-sized quilt, but I wanted to show you how you could use a quilt pattern and make something different with it. So, instead of a quilt, I decided to make an oversized pillow. As you can see, I went for a more minimal layout and only used some of the pieces from the pattern. I really wanted to focus on those two adorable cardinals and the graceful curving branches. I stitched over each applique piece with a zig zag stitch in coordinating thread. I made a border out of dark grey solid cotton and used it again for the back of the pillow. I stuffed it with lots and lots of polyfil, and as you can see, it's still a bit lumpy, but I think with a few more days of squishing and squashing by my two little kids, it will be just perfect and a great addition to our home. Here are the rest of Pat's Girls in the Garden patterns. Adorable, right? And guess what? The great folks at Bigfork Bay Cotton Company are giving away one pattern of your choice to one of my readers!! To enter, please leave a comment at the end of this post. I'll use the random number generator to choose the winner, and the giveaway will close at midnight EST on Sunday, February 26, 2012. And if that weren't enough, all of the designers in the Girls in the Garden Blog Hop are giving away a pattern as well. Be sure to check out Michelle of the Quilting Gallery's project that she shared yesterday, and then join the rest of the girls this week and enter their giveaways, too. But it doesn't stop there! Kimberly and the crew at the Fat Quarter Shop are giving away FIVE full sets of Pat's Girls in the Garden patterns! Visit their blog at The Jolly Jabber to enter. And lastly, be sure to visit Pat Sloan's blog daily this week to learn more about how she designed the Girls in the Garden series. Pat is also giving away a full set of her patterns! So there are are lots of ways to win, and I wish you all good luck! Thanks so much, Pat, for asking me to be a part of the Girls in the Garden Blog Hop! As a fellow midwesterner (MI) I have to admit the cardinal is one of my all time favorite birds, especially in the winter against the snow. Your pillow is such a very, very clever use of Pat's pattern! Very kewl! i love the red birds! They make an adorable pillow! Thanks for a chance to win! How clever to think outside the pattern, and do a pillow! Very clean looking, and you are right, the cardinals just "pop". I really like the dark grey border too. 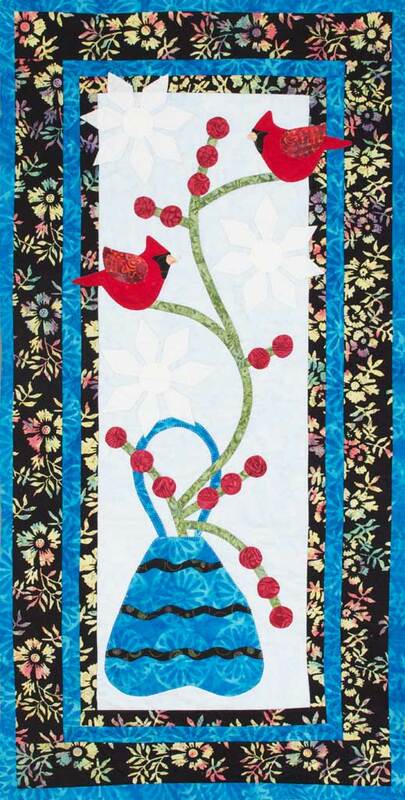 You gave a great idea for another use of the pattern.I love it.The Red Cardinal does a great job in any pattern. I love that pillow you made. It looks so cute. I never did applique on any of my quilts. I would like to try and these gorgeous patterns look just thank you for chance to win.right. You hooked me with your Denyse Schmidt fabrics-one of my favorite fabric designers! Love the pillow. This pattern and what you did with it are all so cute. Love cardinals. Thanks for the chance to win. I love what you did with Pat's pattern and this one is my favorite of them all! So very striking! Thanks for the chance at the giveaway. Your fabric choices are wonderful. I'll have to keep an eye out for more of Denyse's fabrics- they are stunning. Heather, Love those birds. The cardinals are my favorite bird! Here in Florida in spring we get to see a lot of them! What a wonderful way to show case the pattern. I' enjoying the hop. Love how color is used in so many ways. wow Heather this is amazing! LOVE the look of just the branch and Cardinal.. so YOU! Thank you so much for being on my blog hop for my new patterns! Love what you did with the cardinals and it is very striking on the pillow. A fun use of the pattern. How lovely! Especially your applique work. The dark gray border really makes the cardinals pop. If I am so lucky to win, I would pick Amelia's Spring Delight. Your version is beautiful, thanks for a chance at the pattern! Love your pillow. My mother was such a bird fan that it's hard for me to pick just one. Enjoy the spectrum. Like the modern twist and I love oversize cushions (pillows). I sometimes buy cheap bed pillows to use inside my cushions as it is cheaper than fiberfil. I love the pillow. No plans for vacation yet but hopeing to get to the vermont quilt show to take a class and see the show! I would choose Spring Delights if I won the pattern. I love your pillow idea -- very creative. And thanks for showing us the Heat n Bond tracing -- I didn't realize there are snowflakes in that pattern until you showed us! I am a birder, and this design really appeals to me. I love how you made it into a pillow!! It's stunning. I like you minimal approach to this pattern. The pillow is so striking. Thanks for sharing this. Love how you did the cardinals on a pillow. We have several that show up at our house and they are sooo beautiful to watch. Also a Midwesterner (NE) and I love the cardinals. When we moved to a newer housing addition seven years ago, we had no cardinals. Was so glad when they migrated a couple years later. Now we can hear them singing again. Thank you! I love how you just used the cardinals and branches to make the pillow. Beautiful! Oh such a very cute pillow and how wonderful the idea is!! Great pillow! I love cardinals too and see far too few any more! I love the idea of taping it to the window! Thanks for a look at your take on the pattern! Clever use of Pat's pattern. Love the pillow and your colors. Would love to win! I love the cardinal pillow. Those cardinals are just so sweet. How lovely and clever to think outside the pattern, and do a pillow! I love your applique work. The dark gray border really makes the cardinals pop. Thank you for a chance to win this pattern. Your cardinal pillow looks wonderful. We have three pairs of cardinals visiting the feeder. They are like Christmas ornaments sitting in the evergreens. Love all of Pat's patterns in this series. Oh my, I would love to win this pattern. I love when Pat does these blog hops because I get to see blogs I might have never found on my own. Love your choice of colors as it makes the pattern "Pop" in this winter scene! Fabulous twist on this pattern, your son will adore this pillow! Wow, I love your interpretation of this pattern. I have a friend who would enjoy this pillow. so cute! i love cardinals. thanks for the chance to win one of pat's patterns! Loved your pillow. I like that you kept it so simple. Thanks for the chance to win. I really like how you used the pattern to make a pillow. Just love the cardinals!! Thanks for the opportunity to enter your great giveaway! I think your pillow is very sweet. What a great way to use the pattern. Just this morning my bird feeder had some cardinal eating away. How I love the pillow idea! Great use of extending a pattern! I really have a thing about cardinals right now and I love your pillow. Oh this blog hop is super fun! I LOVE this pillow. I think I just might have to make one too! I might make mine out of wool though. Have an amazing day! And good luck to whoever wins! Love your pillow. Thanks for the chance to win. Great job, thanks for showing that window method! The red bird just sparkles. I love your pillow ! I live in Indiana , and the few cardinals that have been hanging out in my big bare bush in my yard have brought me much joy in our gloomy weather ! today we have rainy snow ! It has been a mild winter , and I like it that way ! Your pillow is beautiful! What a great "other" use of Pat's pattern. Great interpretation of the pattern. We get many cardinals visiting the garden year round. Cardinals are one of my favorites-right up there with hummingbirds! They certainly brighten the dreary winter days! Of course, red is my favorite color, too! Love the layout of the pillow you made! It is just beautiful!! Your pillow is beautiful! It's a clever alternative to a wall hanging if you don't ave the space. What a great way to add your own spin on a pattern. Never would have thought to make a pillow. Thanks gor the giveaway. That is a great idea! Use a pattern you love to make a pillow! Awesome! Every time I see these, I think they look like they'd be a great second project to teach my mom how to quilt! She's a bird and garden lover, and I know just where they could hang in her house. I'll pass on the giveaway, but wanted to comment that this is cute. I love how you took your favorite elements of the pattern and played them up! Love the cardinals - I live in the southwest and so miss seeing them every winter...Pillow looks great. I must make one of those patterns so I can see them daily. I love your adaptation of Pat's pattern. Birds are a favorite of mine and those cardinals look great on your pillow. Great idea! I also like cardinals but they don't like in the part of the country where I live. I like the idea of just using a few of the design elements. You did a lovely job of explaining your pillow & it's just beautiful. My dad loves cardinals. Maybe he should get one! Cardinals are symbolic of the winter in so many places. They are a true bright spot in the barren landscapes. Great use of Pat's pattern for a pillow and love the minimalist interpretation. Thanks for letting me enter. I love your red birds. Great!! Cardinals are my favorite birds! I love these cardinal birds. Your pillow is beautiful. Wonderful interpretation of Pat's pattern...you chose the best of it's features! I love those berries and graceful vines too. Thanks for showing us what else can be done... I love how you've taken just some of the design and made it up as a pillow. I love the cardinals you used but I also like Pat's! Beautiful pattern! Pat's patterns are always so uplifting & pretty. Love your rendition. Thanks. I love this pattern and what you did with it....The background (quilt ) really is beautiful! Love your projects! Your clever pillow design is eye-catching. Definitely an example of how Less is More. I love cardinals - do you know Dylan Thomas's line about "birds the color of red flannel petticoats"? I live in Maine and the only cardinals we have are the ones we quilt ourselves. Love your version! I love what you did. It looks clean and simple. And cardinals are my favorite winter bird, so bright in a dreary landscape. What a beautiful pillow and great design! Love Pat's patterns! Love, Love, Love the pillow! Stunning, simple, and elegant. Well done! Cardinals are a favorite bird in my area as well. Thank you for sharing your ideas and for the great giveaway. wha a wonderful idea...I am tempted to do likewise. The pillow is a great idea. The red really stands out. Thanks for a chance. I love it.Cardinals are my favorite birds. thanks for thinking "outside the Quilt", it shows how we can use our favorite patterns everywhere in our homes. How absolutely adorable!! Love it! The patterns are so cute. I love Pat's designs. As I'm from Ohio also - just love the cardinal! This was my favorite pattern out of the series. ~Jody R. WoW!! How striking! Your pillow is awesome. Love the cardinals and they really pop. Thanks for showing us another way to see Pat's pattern. What a great idea using part of design on a different project! I like the way you turned this into a pillow. Hope the kids have fun squashing it! I love seeing your more modern spin on Pat's style of applique! I love what you have done with Pat's pattern. It's always so fun to see how other people make the same pattern. I love the pillow idea. I love this cardinal pillow! and such a creative way to take a great pattern and then make it your own style. Who doesn't love cardinals! The pillow looks perfect with the two cardinals on the white background like snow! 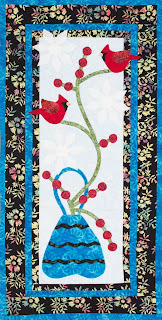 I love those cardinals and Denyse Schmidt fabrics-perfect! I love the Cardinal! I think it is because RED is my #1 favorite color! I love, love, love this pattern... Very creative!! Those cardinals are gorgeous! I just moved to a rural area of Missouri and have seen so many cardinals in my yard. It is a joy to see such color during the bleak and boring winter. I would love to win one of Pat's cute patternss. It's also nice to see what other creative people do with a pattern. I, too, am a native of the Midwest from Missouri and cardinals have always been a bird I followed. When living in Arizona, seeing a cardinal was a big treat. Love the pillow and your use of Pat's design! Your pillow with the cardinals is lovely. Thanks for the idea of something different to make with the patterns. I would love to win one of Pat's patterns. I love this pattern and I would make it just because it has cardinals on it - I love cardinals even though I'm in the UK and I've never seen one! I love your version of Pat's pattern! You kept the best parts and the focus on them - wonderful! I love your pillow. I like the minimalist take on the pattern and red is simply my favorite color so it's very attractive to me! I love how you used the pattern to make an adorable pillow. It looks great. I love your pillow! It would be a perfect gift for me to make for my MIL. Thanks for the chance to win. I love your pillow, it's so crisp and clean looking, the design just jumps off the background! My comment didn't post so here goes again. The red birds are flitting all over our farm. I like the innovative way you modified the pattern to highlight the birds and curvy limb. Thanks for the chance to win one of Pat's Girls. What a fabulous pillow and a great idea too. We don't always have to make things just like the pattern. Love how you used just the cardinals and the vines. Very nice adaptation! I love cardinals too, I wish we saw more of them down here in Texas. Thanks for sharing the great pillow idea, and for the chance to win! I adore the pillow - the cardinals are sweet! thanks! I love the cardinal pillow. That is my state's bird so I really should think about making the pillow as well. Great adaptation of Pat's pattern! What a great pillow for Spring/Summer with the cardinals. Thanks for the inspiration. my state's bird and my teams mascot, so you know i love the pillow and the fat little cardinal. i have a about ten at the feeder as i type!!! nice blog and great giveaway. I really liked the way the deep grey color used for the pillow made the design very modern--it showed that you could take a folk-art design and modernize it just by using color! We live in Canada and I love cardinals! The brillant flash of red against the snow is breath taking! Love your pillow!! Cardinals are gorgeous!!! Now that is way too cute! Love the idea of making it a pillow. I love this pattern. It is my favorite of the four. I also love your quilt that is pictures on Pat's blog. Love the cardinals. Even though we don't have Cardinals in Australia they are still one of my favourite birds. These are all lovely patterns, thanks for the chance to win one. I love your idea to make a pillow out of the pattern and I love cardinals. I'm a western girl out of So. Cal. but have relatives in Ohio and Mn. so definitely love the birds. Cute idea to make a pillow out of just parts of the pattern. I love the idea of the pillow. I think mine will include the snowflakes. I love the red birds on the pillow...so pretty. That is such a creative way to use a wall hanging pattern and make it into a pillow. It turned out great. I love the colors also! I LOVE your pillow!! I want to make one just like it!! Thanks for the chance to win!! Love the cardinal pillow! My husband's favorite bird is the cardinal and this would make a nice gift. Thanks for the idea! I really like how you made the pattern with your own flair. I love the pillow. Love your take on Pats quilt...nice to see alternate uses for our patters, just need to think outside the box...and your little cardinals are so cute...just like the real thing. Thanks, Sandy G.
I love your minimal take on this design! (of course, being a birdlover, I love the original, too!!) Thanks for sharing your ideas! Oh the pillow is beautiful! Thank you for the chance to win! I love your pillow. The reds are wonderful! Love the pillow. It is so bright and spring like. I love cardinals. Way to go-great idea for a pillow. Great Job! Thanks for the opportunity to win. I love how you turned the pattern into something completely different than the original!! How inspiring! Thanks. I love what you did with the cardinals. My mother has cardinals that nest in a tree outside her window in Tennessee and I made her a cardinal quilt several years ago. I may just have to make a pillow like yours to go with it. Your pillow version of Pat's design really finishes the look w/aunt ollie's churn dash quilt. Great adaptation! Thanks for the tip about the zig-zag edge. I wondered how the applique was done. LOVE what you've done with her pattern - what a fabulous pillow! adorable! I love what you've done with the cardinal. It's so interesting to see variations on patterns. It helps get the 'creative juices' flowing. I love your pillow - it is happy and bright, and made me feel good just looking at it. And it inspired me to look at patterns in a different way, and maybe just take an element and make a project, like you did. Happy stitching! I really like the simplicity of the cardinals on the pillow. It is a cherry scene during winter days. Oh how I miss seeing Cardinals. Living in CA has its drawbacks! Love all of Pat's patterns and you did a wonderful job. I really like how you showed you could use just part of the pattern. Great idea! Pillows with cardinals would be great for Christmas decor. Cardinals are probably one of my favorite birds. We seem to have more hanging around our home this year and I love it! Thanks for sharing. The pillow so pretty!! I loved it. I love the cardinal and love the way you made that pretty pillow..thanks for the giveaway..
Love the pillow! What a great use of the pattern. Hello fellow Ohio quilter! Gotta LOVE our beloved cardinals! Very do-able project! Thanks for sharing! I love the pillow and have enjoyed the creative use of Pat's pattern. I enjoyed visiting your blog today. You used my favorite pattern. Love the cardinals and what a great idea to use them in an adorable pillow. Chance to win..fantastic! Great idea. Makes a cute pillow. Oh, now this is a very pretty pillow. I like the way you used her design. The pillow is very elegant looking. Great job. Great twist for pattern use, thank you! Thanks for showing how you traced the pieces. That will help next time I applique. Love Pat's Cardinals and love your choice of pattern! Very cute use of the pattern. My Mom is a cardinal collector, so she'd really love for me to make this one for her. Thanks for the chance to win a pattern. This is my favourite of the 4 patterns and I love how you have minimised the design in your cushion. It is gorgeous. I love your rendition of Ana's Winter Flurries. Your pillow is quite delightful with the colorful cardinals on white background with black. The cardinal is North Carolina's state bird, the state I am living. We feed them throughout the winter. I just love seeing them at our feeder. amazing pillow. I really love it. Very cute pillow. Thanks for the giveaway. I love what you did with the pattern! It reminded me how to look at things/patterns and make them my own! Beautiful pillow! The pillow is simplistic and gorgeous. You certainly did justice to the gorgeous birds. I enjoy the cardinals in the winter at my birdfeeder so I sure like that pattern. I LOVE the red birds in winter. Love these patterns. What a great way to show an alternative to making a wall hanging! Your sweater idea is so great - I want to design a pillow right away. In British Columbia we don't see Red Cardinals but we have Stellar Jays which are a much larger dark blue bird and very aggressive. Thanks for the idea. Is is brilliant what you have done with this pattern!! !, love it. I love your cushion. I love these patterns but the way this blog hop is adapting them and showing new ways to use them and decorate with them is fantastic. This is my fav pattern of Pat's series. And your pillow is wonderful! Love it!! Love the cardinals! Thats a wonderful use of the pattern. This is my absolute favorite of the patterns b/c it has cardinals. I just love your pillow. Very cute idea to switch things up to a pillow. How fun. Love your cardinals! Bright, cheery, modern! Good use of the pattern, taking it outside of the norm. Love your take on the pattern. Sweet pillow. I just love the red cardinals....they sure pop on this project. I love what you did with the pattern. I enjoy seeing your process, thanks. That is one very sweet pillow...love that you turned the pattern into something different. The red of the cardinals make the pillow pop. Beautiful!